Has your brain repaired itself since melting down during Sunday’s totally wild Game of Thrones battle? “The Spoils of War“ saw – SPOILER alert – Daenerys riding atop Drogan and blowing the Lannister army to smithereens, and it was nothing less than friggin’ epic. Though this was the shortest episode in the series’ history, it managed to pack in a ton of minor details and major moments, like another Stark reunion and a very historical discovery (we see that CVS receipt for a box of chalk Jon, you ain’t fooling us). But did you catch the many callbacks and Easter eggs? “The Spoils of War” had an epic battle, a thrilling sword fight, cave-dwelling flirtation, and some tear-inducing reunions. But there was one single shot that stole the show: Littlefinger realizing he doesn’t have any more tools in his conniving toolbox. After giving Bran the catspaw assassin’s dagger, possibly in an attempt to win over the young Stark boy, Bran dropped some Three Eyed-Raven knowledge on him. 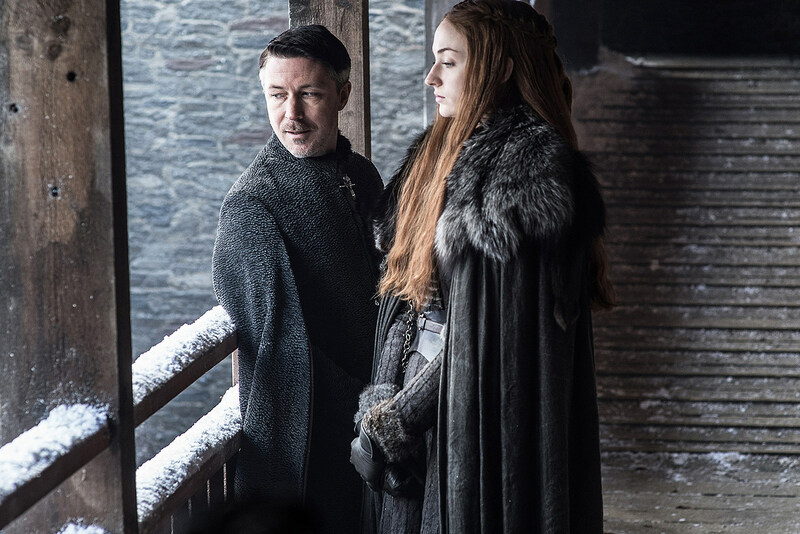 “Chaos is a ladder,” Bran said to Baelish, a line only an opportunist like Littlefinger could come up with. 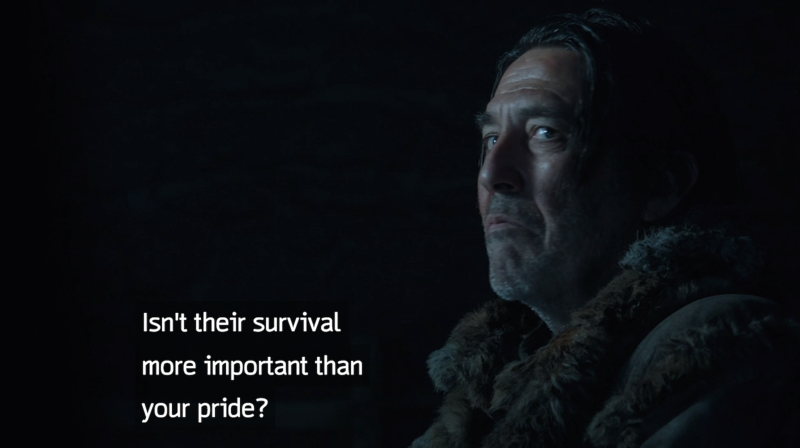 This was a direct callback to Season 3 Episode 6 “The Climb“ when Littlefinger said this very same line to Varys in the Great Hall. 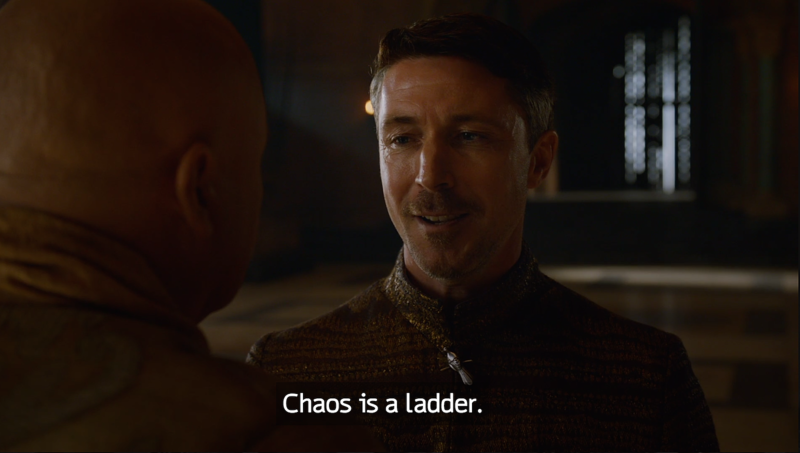 When Varys said “Chaos is a pit,” Littlefinger quickly corrected him with a mantra that sums up the latter perfectly: Petyr Baelish is a man who thrives among disorder, finds opportunity in the absence of order and uses the wreckage of those around him to build his own path towards power and control. Bran reciting this back to him was the slickest way to cut Littlefinger down, showing him Bran the Three Eyed-Raven isn’t a foolish boy charmed by trinkets, but a being capable of more power than Littlefinger could ever imagine, including the ability to know all of Littlefinger’s secrets. Back to the catspaw assassin’s dagger. This isn’t just any weapon. 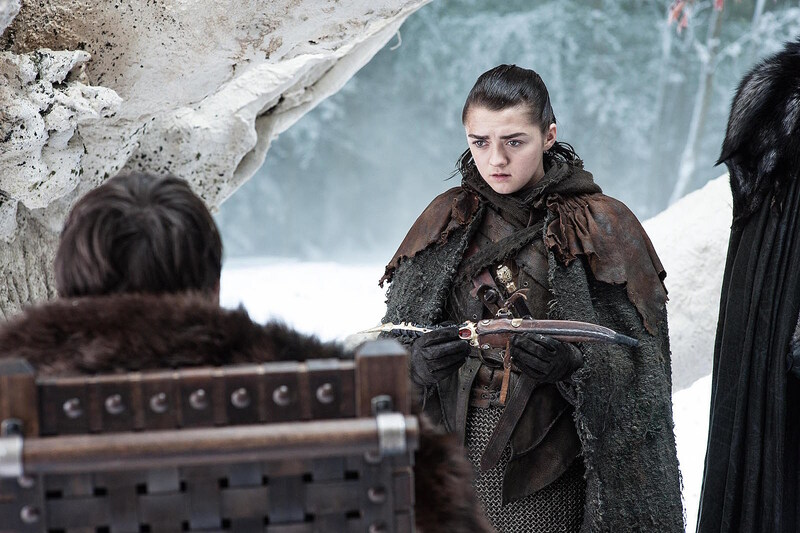 As the show made sure to clarify with Arya’s dialogue, it’s a dagger made of Valyrian steel. (As a reminder, Valyrian steel is one of the only two known ways to destroy White Walkers; the other is dragonglass, which Jon is currently digging up.) This season already primed us for the dagger’s return, with that lingering shot of a sketch in Sam’s book in the Season 7 premiere. So why does it matter that Arya now wields it? With all of his knowledge, there’s no way Bran – sorry – the Three-Eyed Raven gave his sister that weapon simply because he didn’t want it. We don’t know exactly how much of the future he can see (he did say it comes to him in fragments), but giving the dagger to Arya certainly feels like foreshadowing the youngest Stark’s role in the war to come. She’s one of the best fighters in the North, nearly defeating Brienne, and with a Valyrian blade she’s going to be a vital player against the White Walkers. That theory about Arya killing the Night’s King is sure sounding good right about now. Arya and Brienne’s duel was one of the highlights of the season (really any Brienne moment is a highlight in my book). Beyond the thrill of watching Arya nearly triumph, and the joy of Sansa and Littlefinger watching in amazement, the fight choreography itself was a clever nod to Arya’s past. As Vanity Fair spotted, if you look closely you’ll notice Arya’s moves are directly influenced by the fighters who trained her – the sly, nimble swordplay of Syrio Florel, the knowledge of where to strike her opponent from the Hound, and the swift ducking and kip-up moves taken from her time at the House of Black and White. Arya has had quite the fashion evolution since we met her seven years ago, with hairstyle and costume changes that have reflected that journey. But this season’s changes, and most notably this past Sunday’s, were especially telling of her growth. This year, Arya has began to wear her hair in the same style as Ned, half pulled back, half down. And though she donned tattered brown rags after leaving the Riverlands this season, her arrival at Winterfell on Sunday sparked another change. 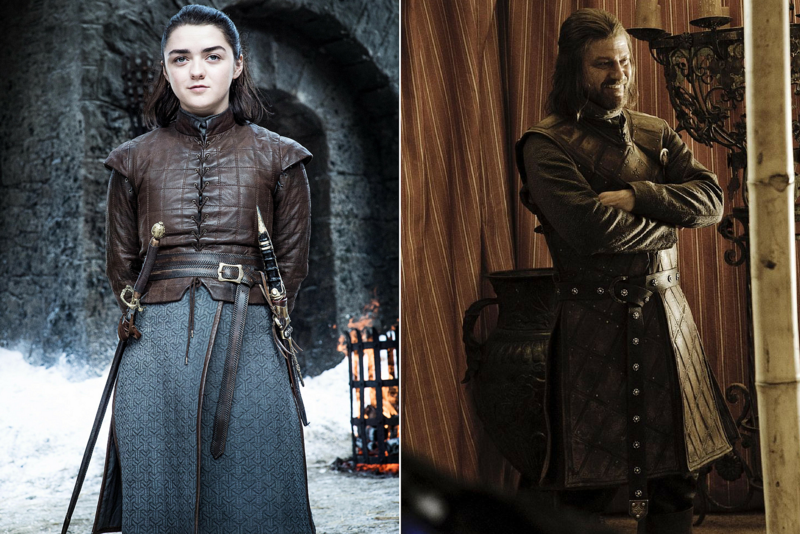 After visiting Ned’s statue in the crypts, Arya emerges in the Winterfell courtyard in a tight-fitted leather outfit and skirt that practically makes her a Mini-Me of Ned Stark’s Season 1 attire. While all the Starks seem to be lacking in their Stark-hood this season, Arya is quickly easing back into her family roots and upholding the memory of her father. When Jon and Sansa reunited last season, he promised his younger sister cousin that he’d protect her. “No one can protect me. No one can protect anyone.” Sure, Sansa was probably just being a cynic, but this week gave a fun little nod to a fan theory about said no one’s identity. 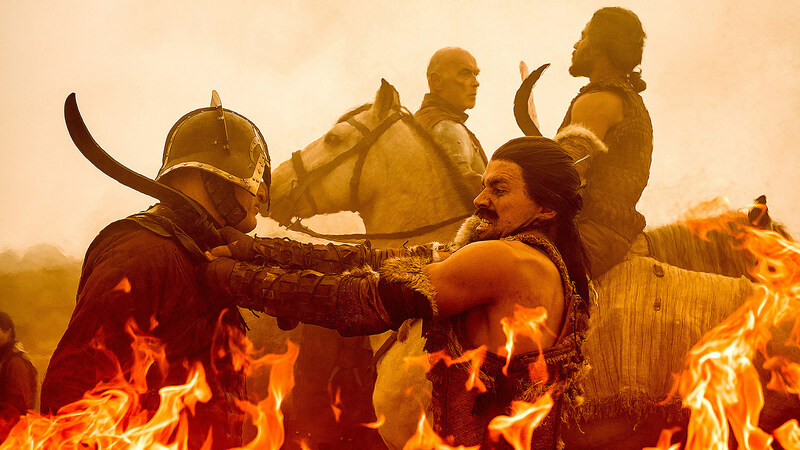 Fans were quick to spot those familiar two words, repeatedly uttered by Arya in Braavos last season, theorizing that Arya would soon reunite with her old sister and help protect her. And last night, shortly after their reunion, Arya exhibited that she’s an equal, if not superior, fighter to the warrior who vowed to protect Sansa. 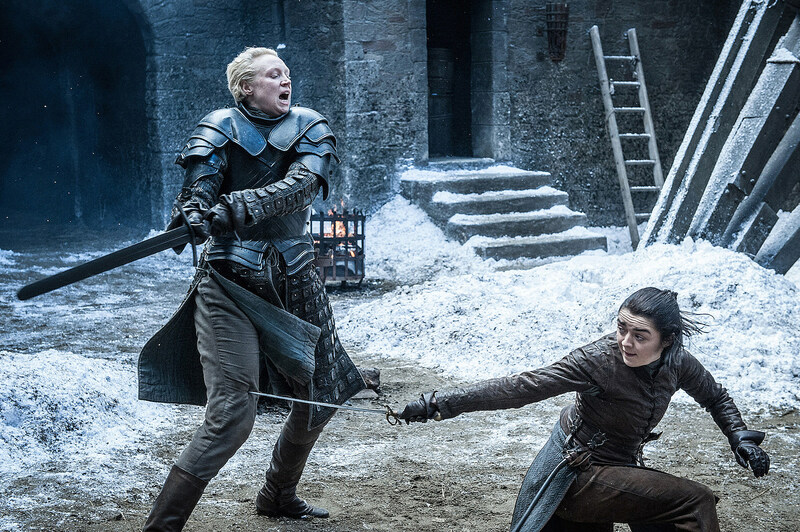 Then, in a clever bit of wordplay, Arya told Brienne who taught her to fight: “No one.” I’m going to wager that Arya may also use that dagger to save Sansa by taking out its previous owner. Watch out, Littlefinger. They go from town to town, looting and burning, killing every man who can’t hide behind a stone wall. Stealing all our crops and livestock, enslaving all our women and children. 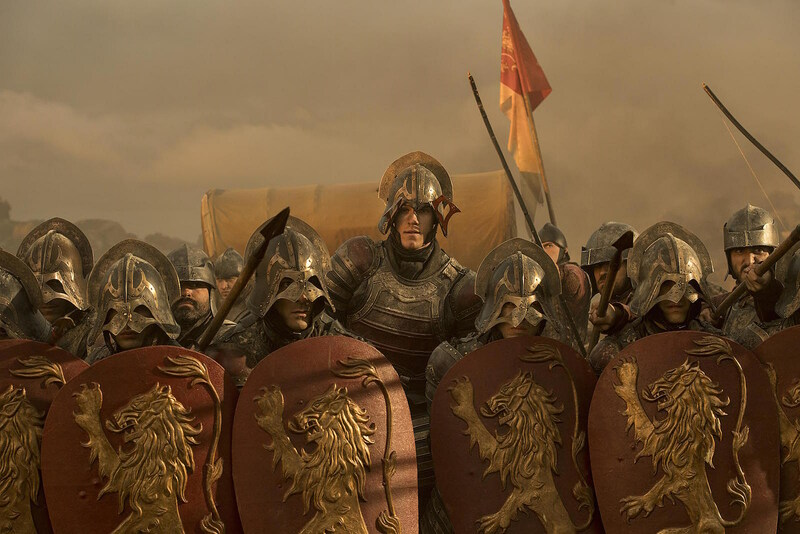 How long do the people of the Seven Kingdoms stand behind their absentee king, their cowardly king hiding behind high walls? When do people decide that Viserys Targaryen is the rightful monarch after all? Ah, if only Cersei and the Lannister army took that advice when Daenerys (instead of her dead bro) arrived atop Drogon to do exactly that, burning the men and their supplies to dust. Robert knew back in Season 1 this day was coming, hence his order to have the last Targaryens killed. There have been a few parallels this season between Jon’s and Daenerys’ words – he spoke about pardoning children for the sins of their fathers and ancestors episodes before she asked the same of him upon their meeting. On Sunday, Dany pushed back on Jon’s refusal to bend the knee with a line that he once used to convince a former enemy to also pledge a new allegiance. “Isn’t their survival more important than your pride?” Dany says to Jon, referring to his people in the North. Jon used the very same words in Season 5’s premiere, “The Wars to Come,” when asking Mance Rayder to bend the knee for Stannis. The request wasn’t exactly Jon’s; he was just relaying Stannis’ offer, but now he’s in a possible position of authority where he must make the tough call on behalf of people. We all know how that request ended for Mance, but Jon and Dany are going to have to come to an agreement eventually, and after Sunday, I have a feeling that agreement might just happen between the sheets – obviously “bending the knee” is just Dany’s literal request for Jon to recreate the, uh, “many things” Missandei and Grey Worm did. Who could forget Stannis’ passive aggressive grammar lessons? The late Baratheon was a stickler for proper grammar and made sure to correct Ser Davos under his breath more than once. 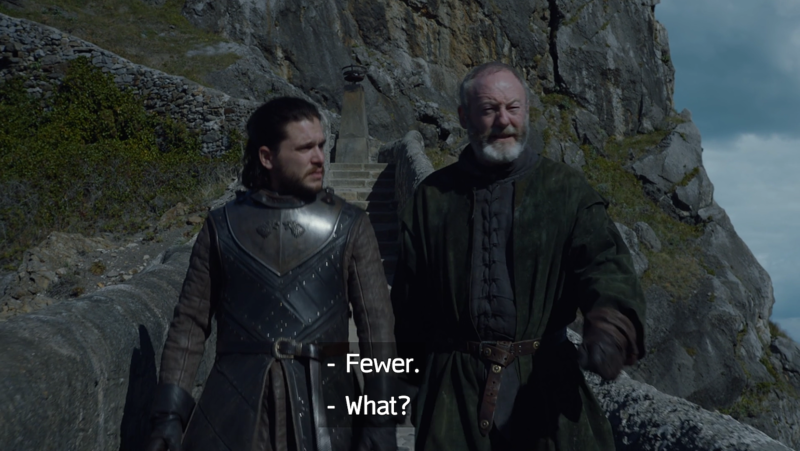 If there is one word that will keep Stannis’ memory alive it’s “fewer,” and after repeated corrections, Davos proved on Sunday that he’s finally learned his lesson. “How many men do we have in the North to fight him? 10,000? Less?” Jon says to Davos outside Dragonstone. “Fewer,” Davos quickly injects. Stannis would be proud. 10. Hint hint, wink wink – did you know Jon’s last name is up for debate? Here’s some speculation you’ve never heard before – seriously, this is a brand new theory that’s never been discussed among fans nor hinted at in the show: Jon Snow ain’t Jon Snow! Okay, obviously the impending reveal of Jon’s father is so close that the show’s writers can’t even avoid winks at it. Last week, a dragon made a big ol’ scene, flying directly over Jon’s head when he claimed he wasn’t a Stark. 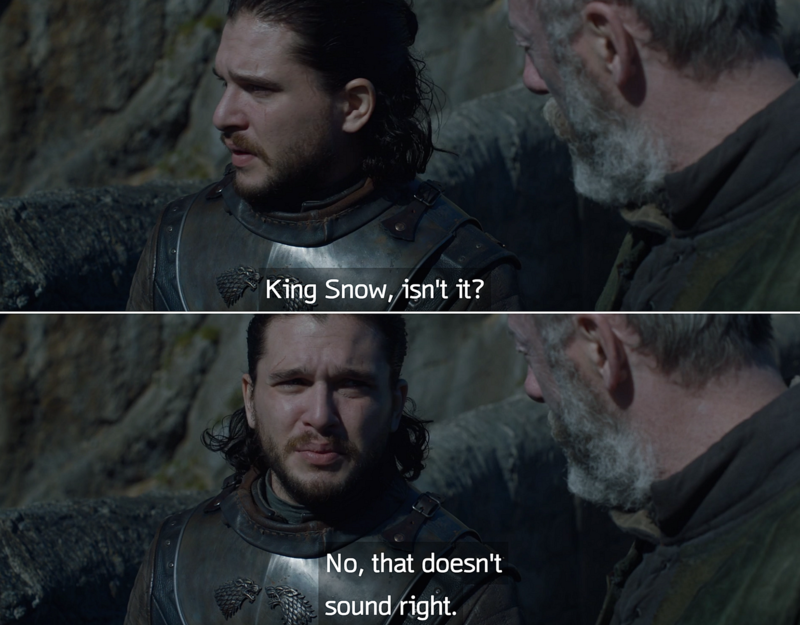 And on Sunday, Davos considered the title “King Snow,” before admitting nah, that doesn’t sound right either. King Jon Targaryen, just say it already!